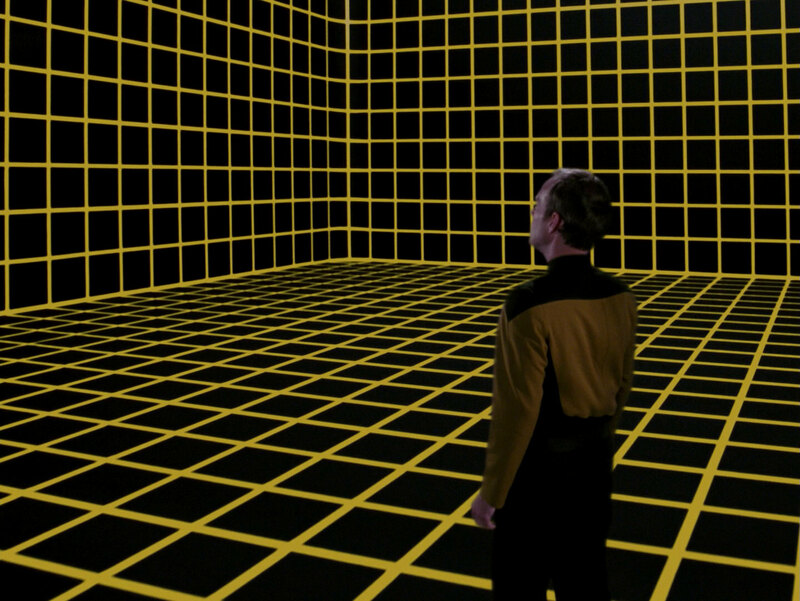 Ex Astris Scientia - Observations in TNG: "Hollow Pursuits"
Here are some observations about sets, props and visual effects in TNG: "Hollow Pursuits" without a specific theme, and a comparison of the original TV release (TNG) with the remastered episode (TNG-R). 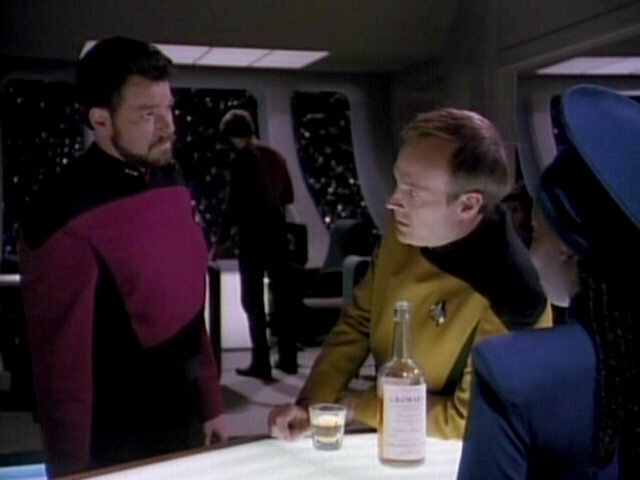 The label on Barclay's whisky bottle. 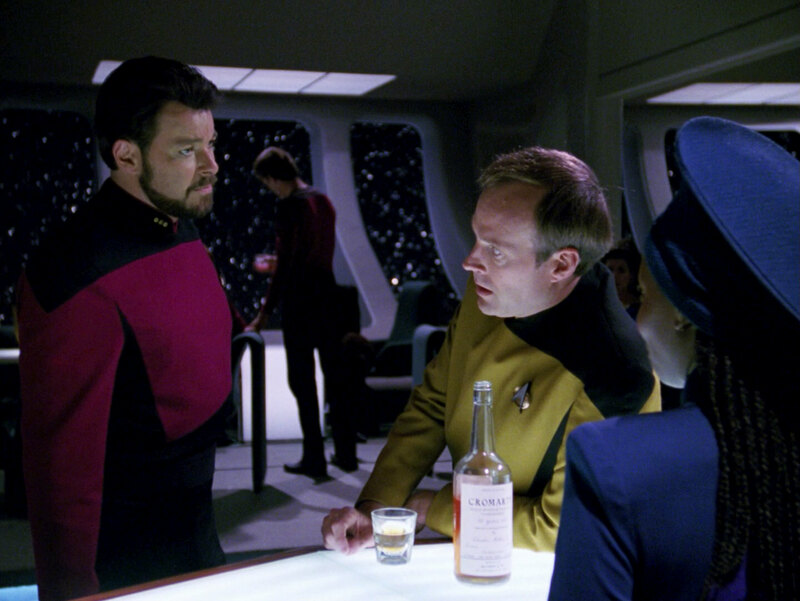 The HD still reveals that the bottle comes from the Cromarty distillery. 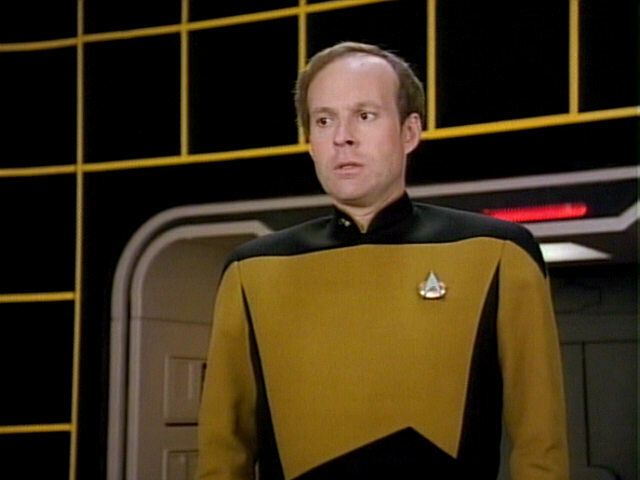 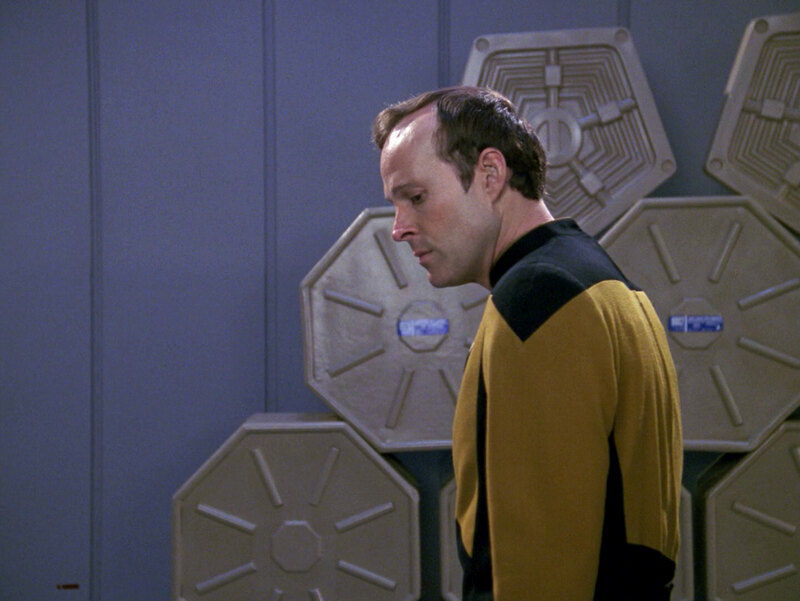 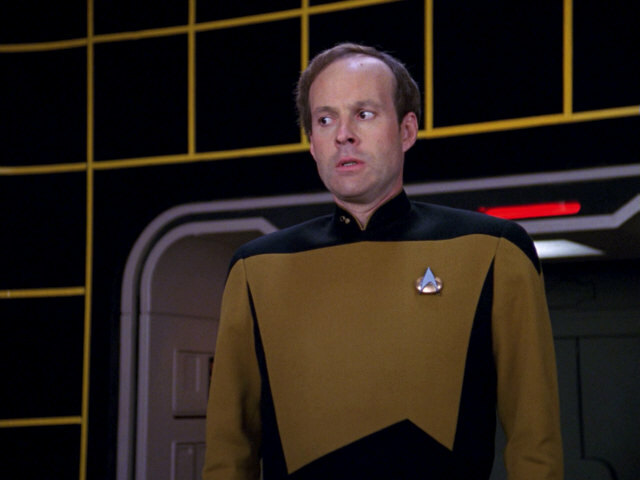 The yellow stripes of the hologrid around the door behind Barclay looks like in other episodes. 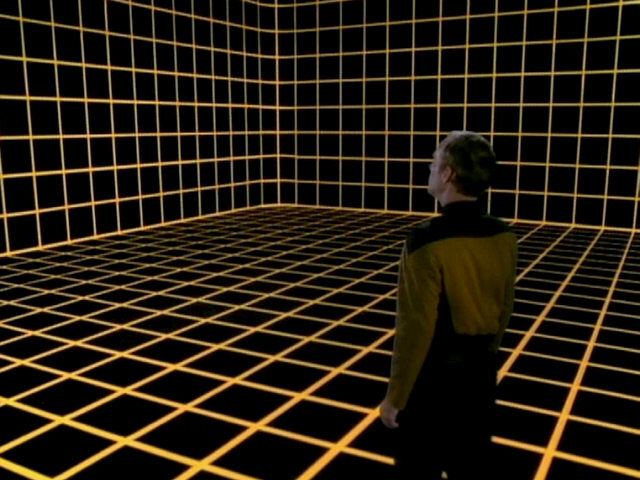 In contrast, the hologrid visible in opposite direction seems a lot wider than that. 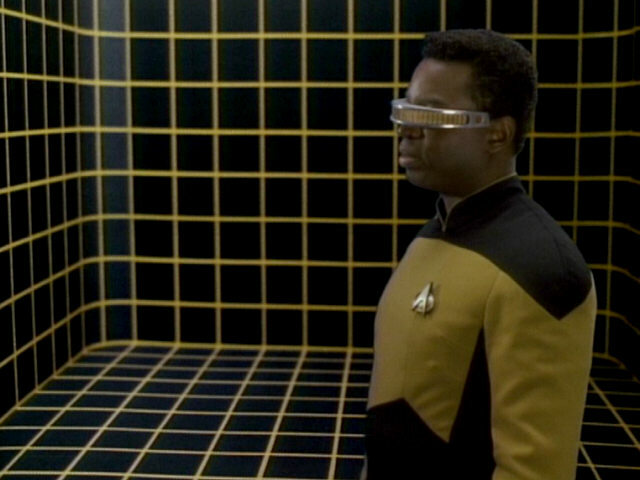 "The Defector" The width of the grid lines is inconsistent in TNG-R too. 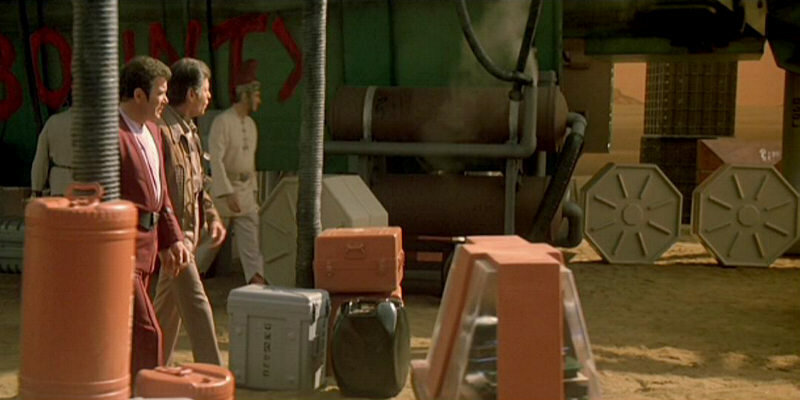 Hexagonal and pentagonal cargo containers can be seen behind Barclay. 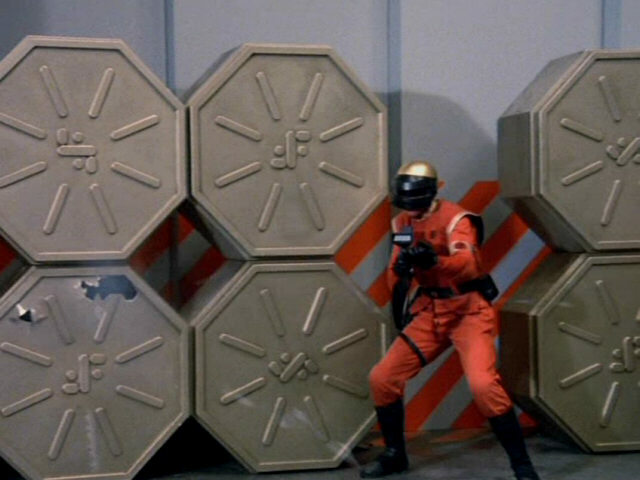 Similar hexagonal containers were also seen in the various V - miniseries and "Star Trek IV: The Voyage Home", while the pentagonal containers first appeared in various places in "Star Trek V: The Final Frontier". 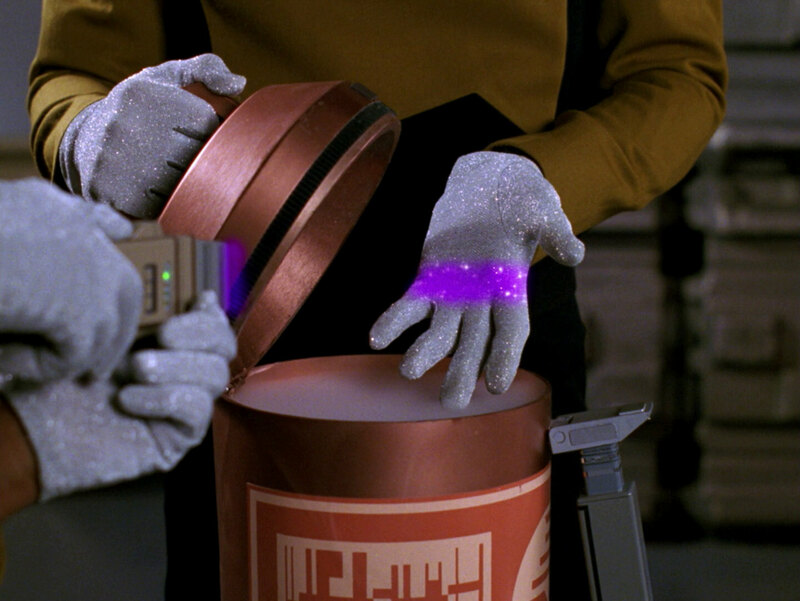 "Star Trek V" A better look at the containers in HD. 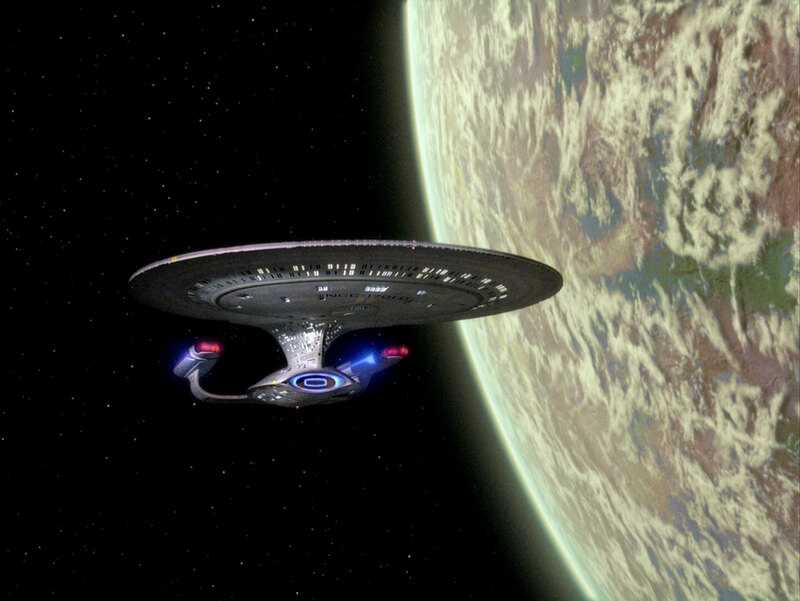 The Mikulak homeworld previously appeared as Bringloid V in "Up the Long Ladder". 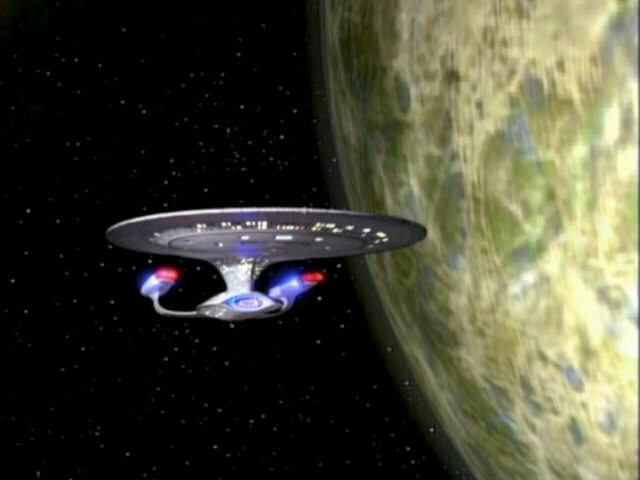 Re-Used Planets in TNG In TNG-R, we can see a new planet with very similar colors. 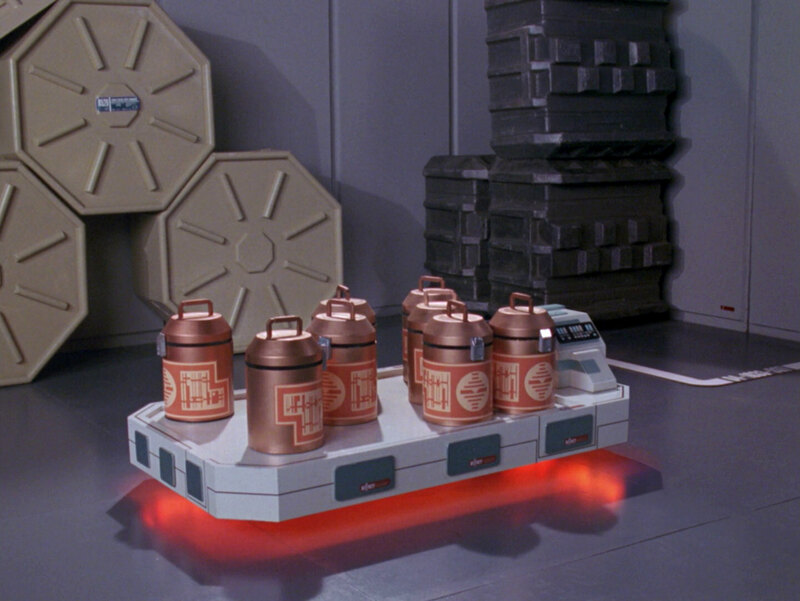 Interestingly, the anti-grav unit (or sled) has a red anti-grav beam, while the anti-grav sled, as seen in countless episodes, has a blue beam. 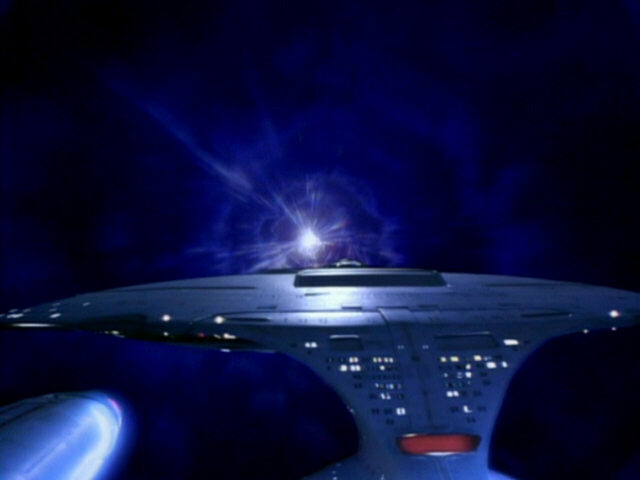 "The Enemy" The antigrav unit in HD. 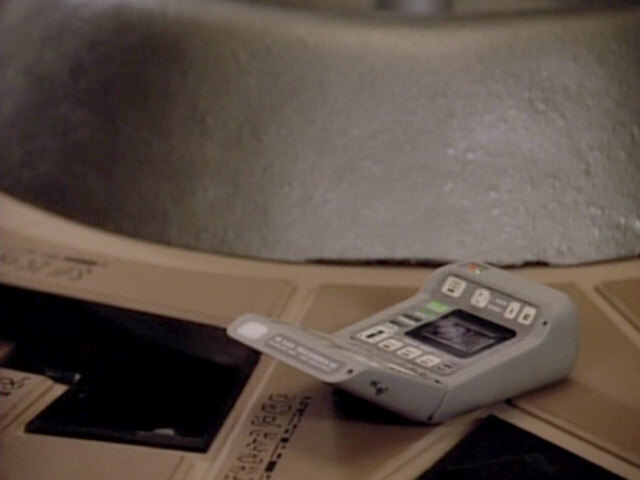 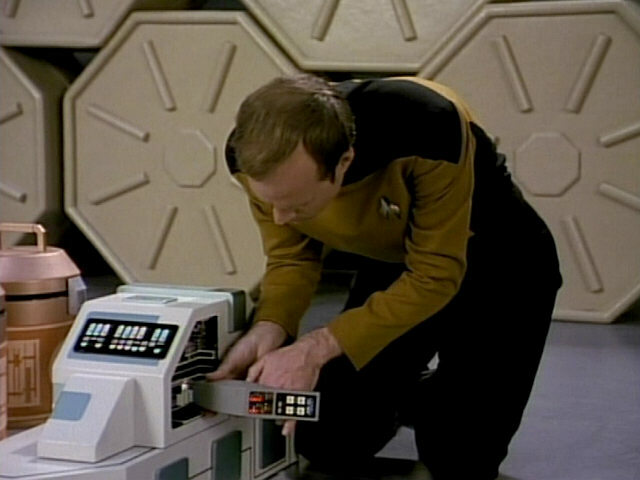 The scanner used by Barclay to scan isolinear chips here was also used by Geordi La Forge and Wesley Crusher in "The Dauphin" when they scanned the warp core. 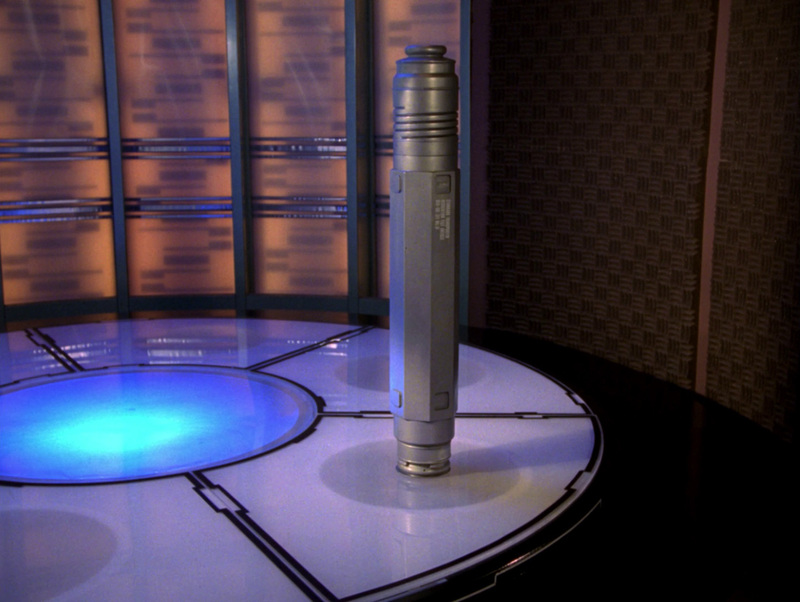 "The Dauphin" The device in HD. 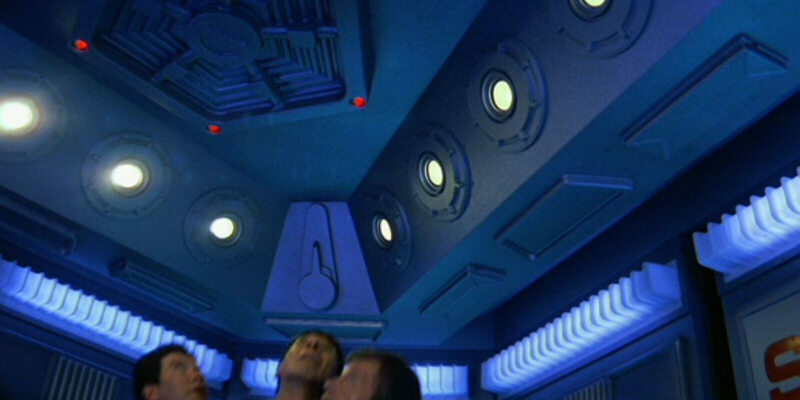 A shot from "Where No One Has Gone Before", showing the warp core from the same angle, illustrates that the set has not changed much since the first season. 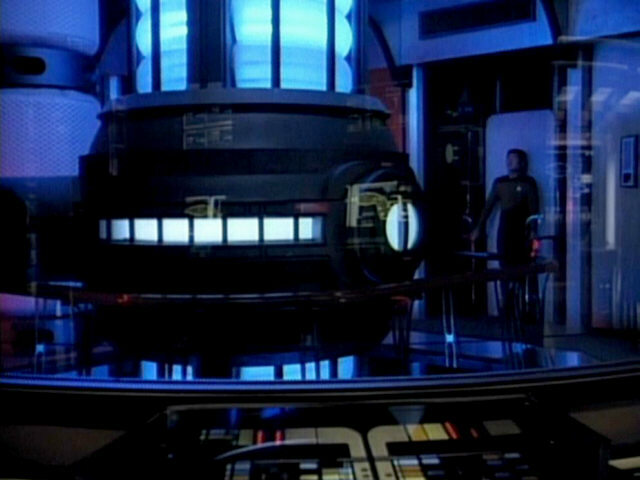 The main engineering lift was made a little safer with a glass cabin and the console in the engineer's office was made a lot smaller. 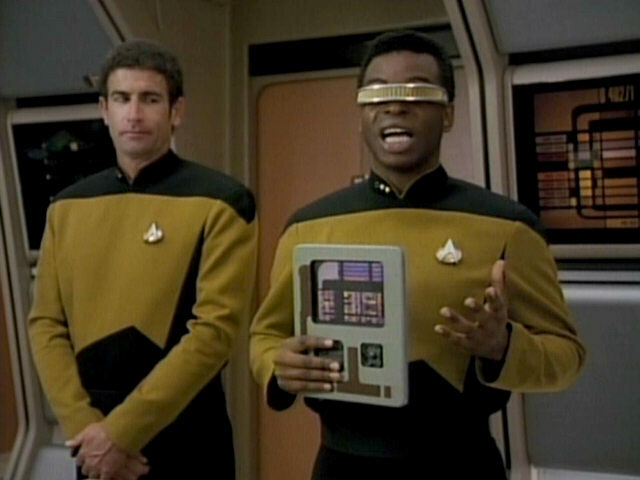 Geordi is holding a very large PADD in this shot. 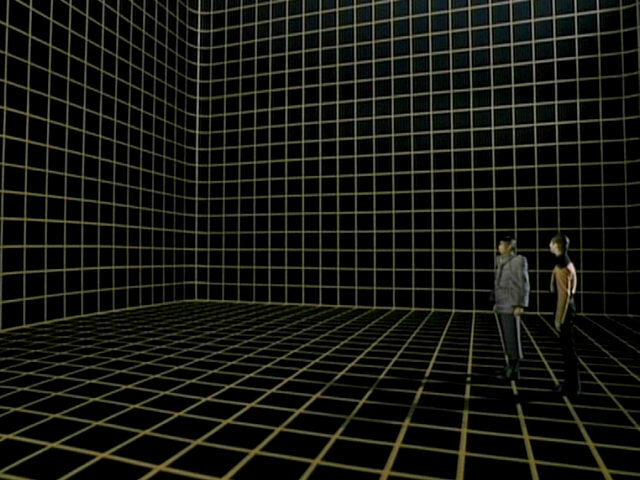 PADDs of this type first appeared in the season 2 episode "Contagion". 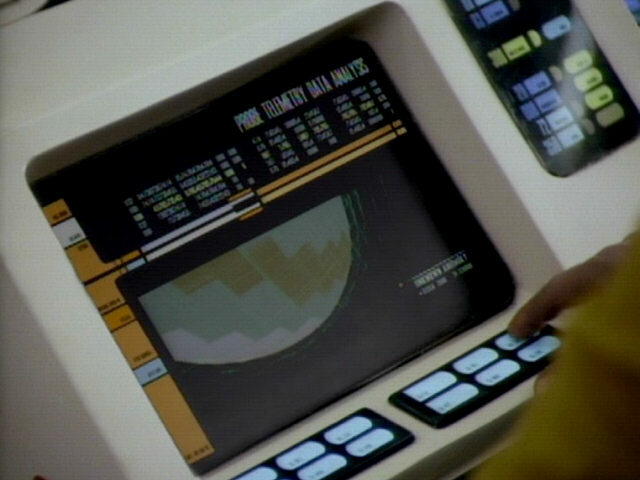 This exact PADD was first seen in "Pen Pals", though. 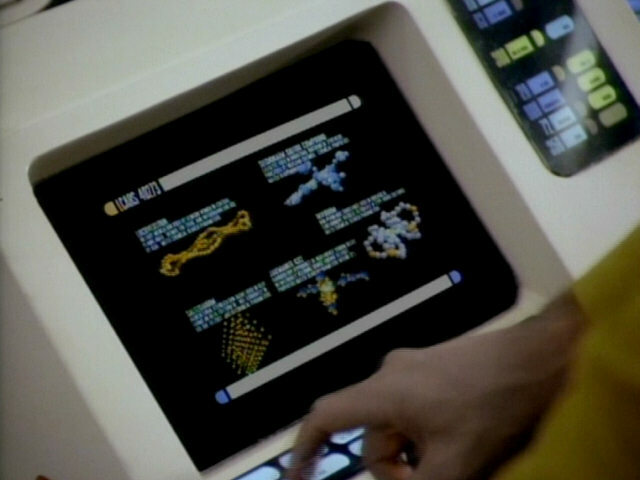 "Pen Pals" An HD close-up of the PADD. 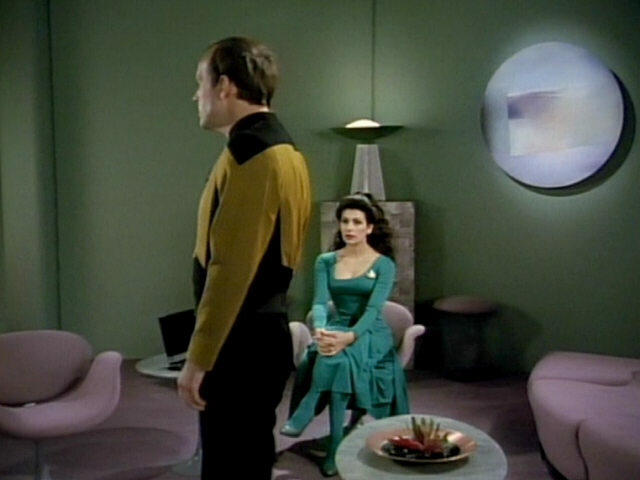 Troi's office was last fully seen in "The Price". 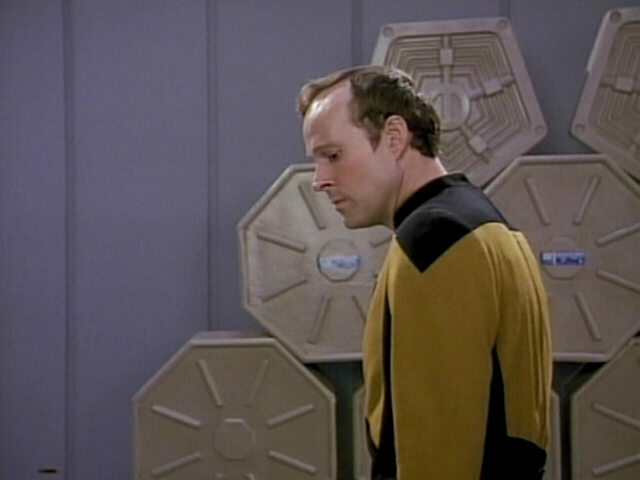 The circular piece of wall art has changed since its last appearance. 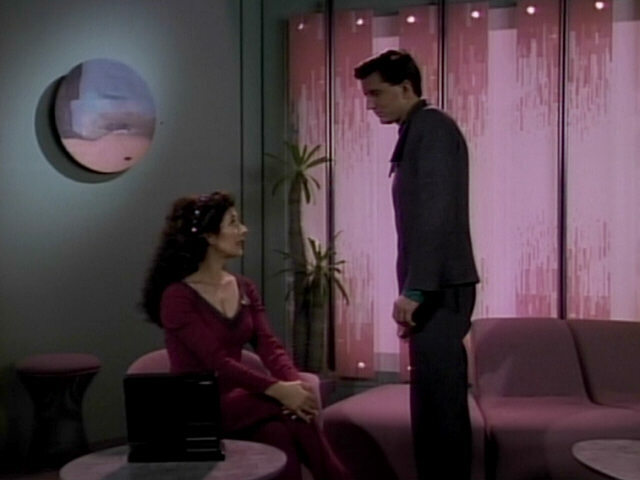 The unique pink wall panels in Troi's office can be clearly seen in this screenshot. 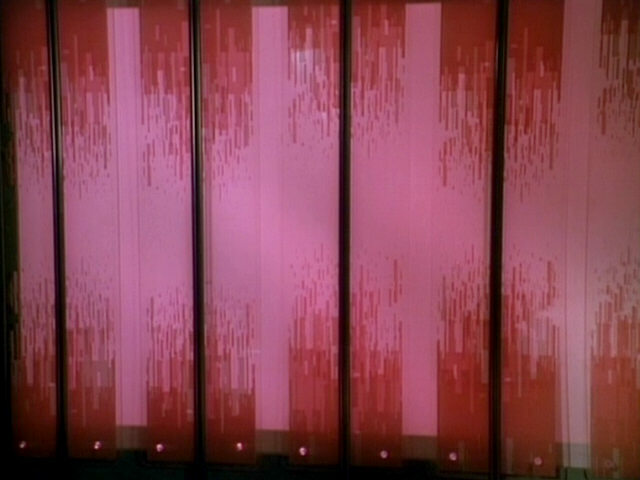 As can be seen, the pink was much paler when the set first appeared in "The Icarus Factor". 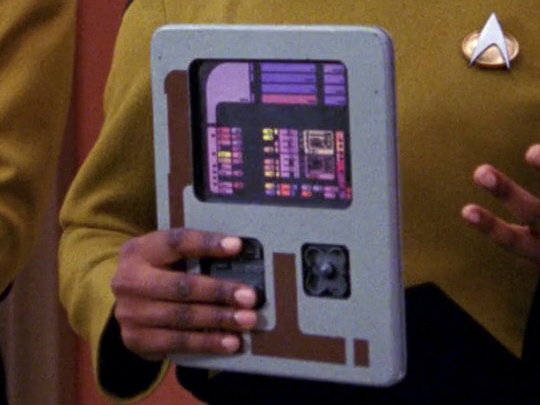 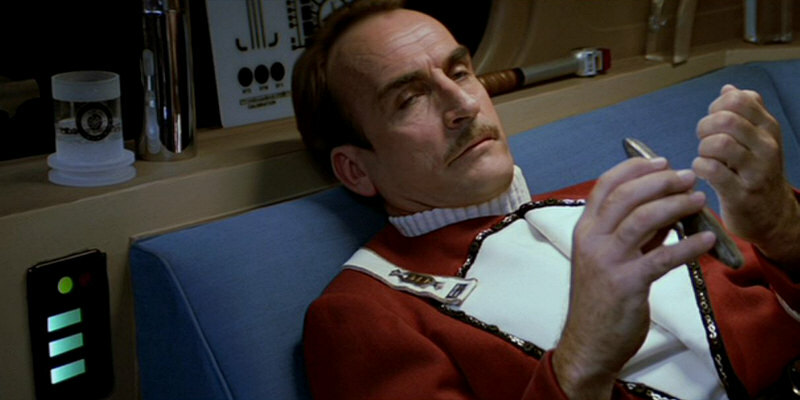 A good look at the season 3 tricorder and the warped glass. 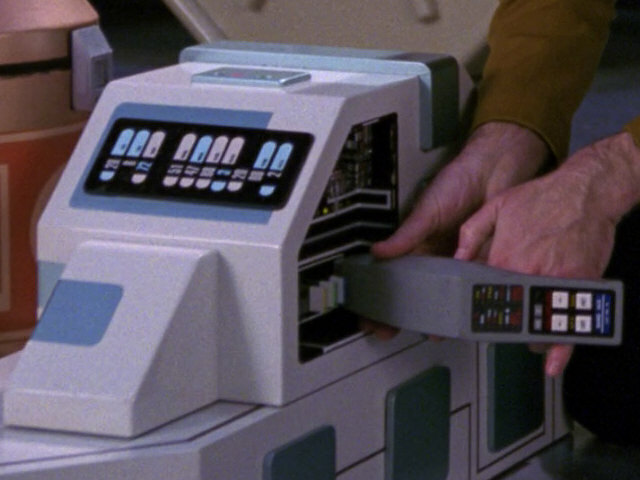 The screenshot of the season 1+2 tricorder from "Contagion" shows that the new tricorder no longer has a noticeable on/off switch. Glasses of this type were first seen in "Star Trek III: The Search for Spock". 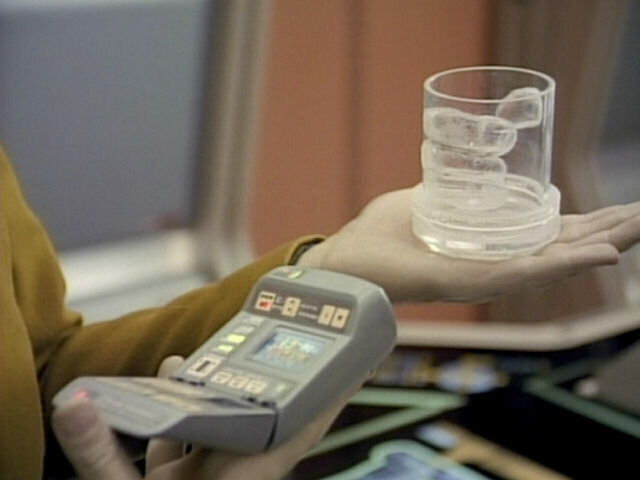 "Contagion" A look at the glass and the tricorder in HD. 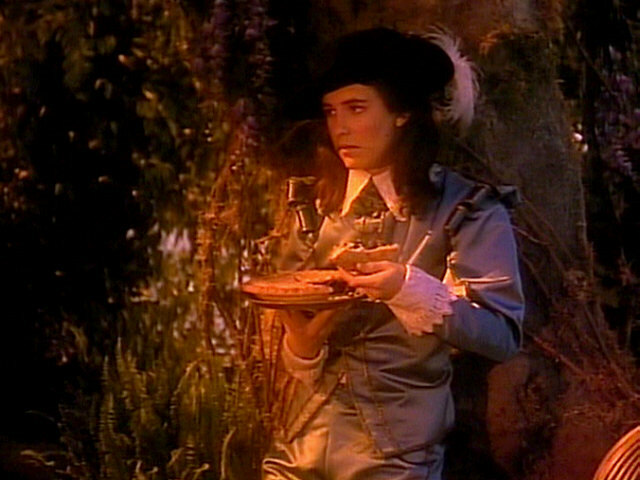 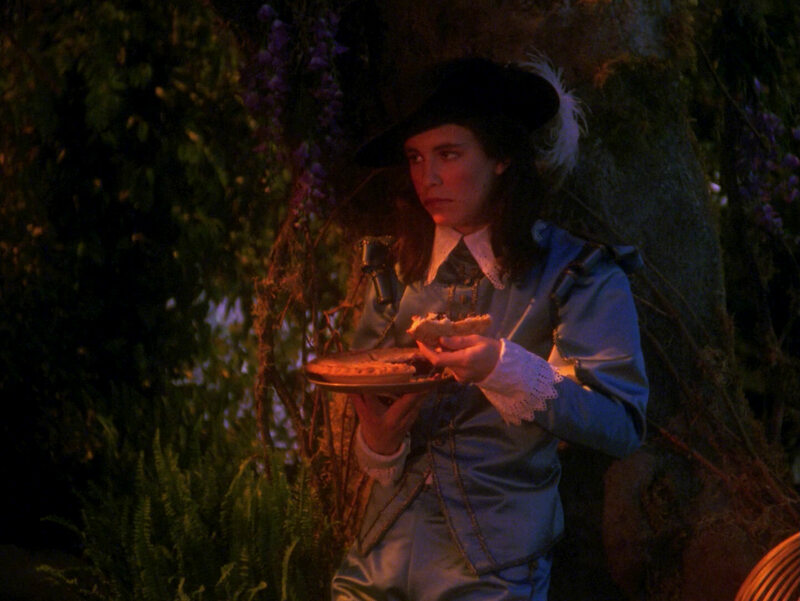 The costume of the holographic Wesley is based on the costume worn by the "Blue Boy" on the famous painting of the same name. 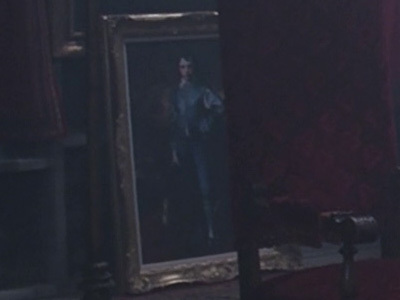 The painting was seen in Moriarty's lair in "Elementary, Dear Data". 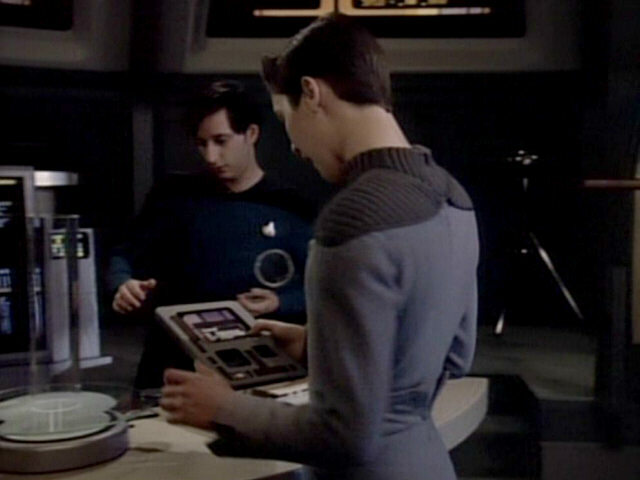 Dear Data" The "Blue Boy" in HD. 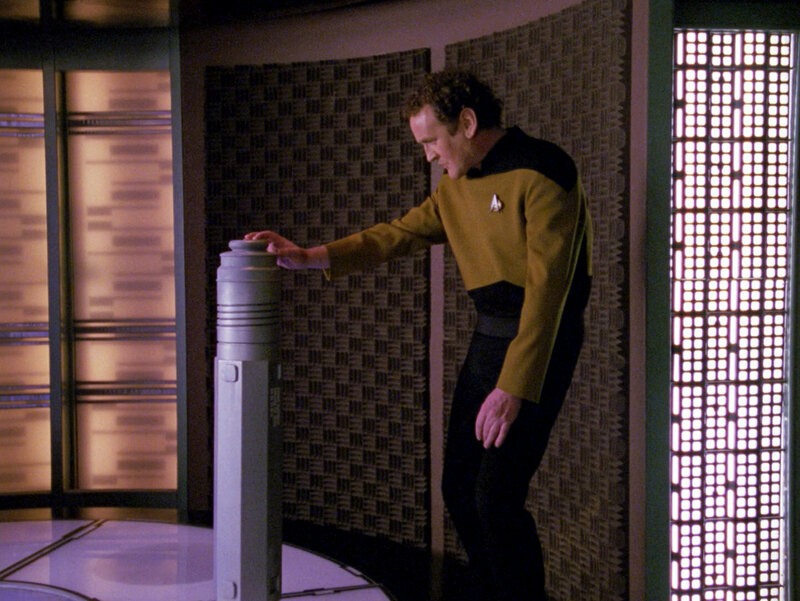 This is the second appearance of a transporter test cylinder on TNG. 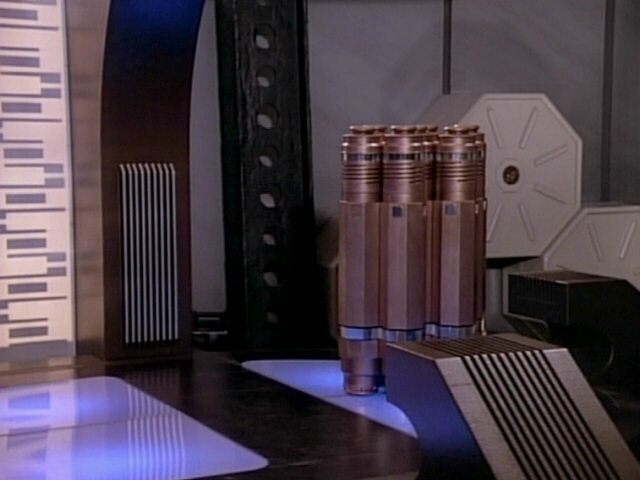 Cylinders like this were also seen in "The Ensigns of Command", but also appeared as felicium containers in "Symbiosis". 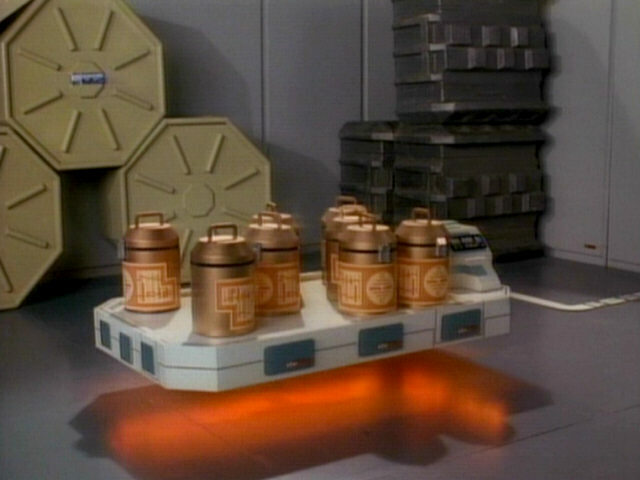 In real life, these are containers for sonobuoys used by the U.S. Navy. 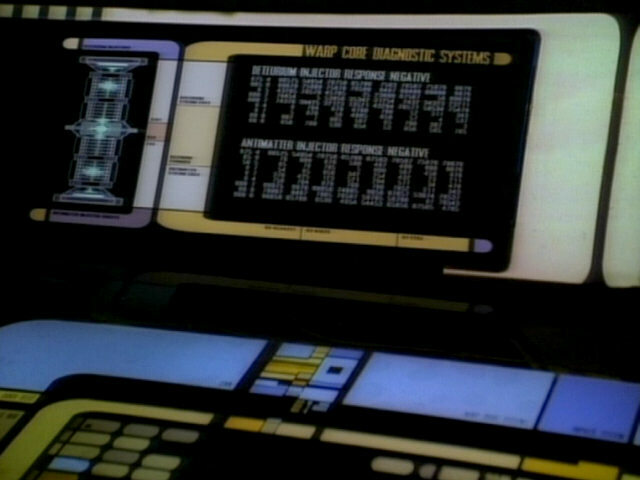 A warp core diagnostic displayed on a monitor in main engineering. 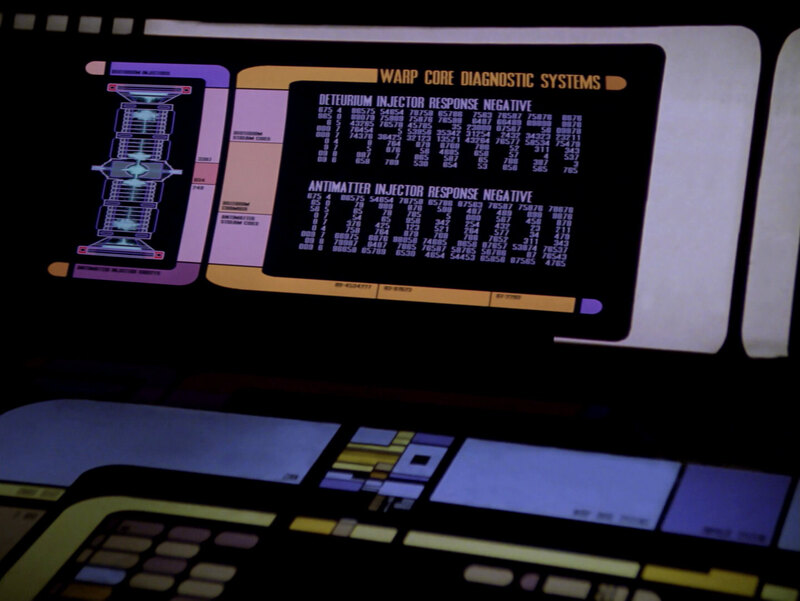 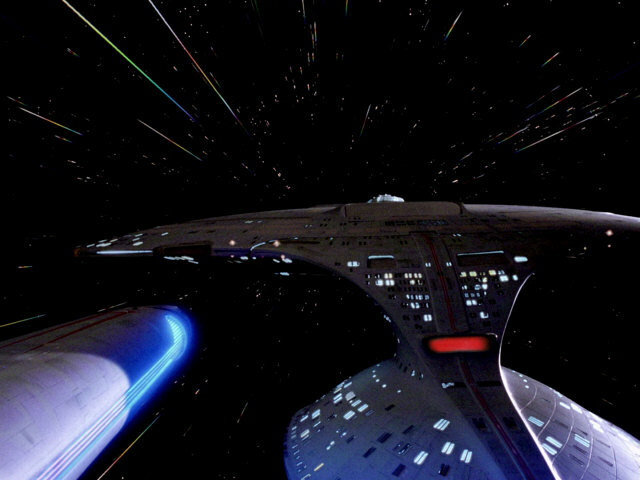 The graphic of the warp core was originally created for "Booby Trap". 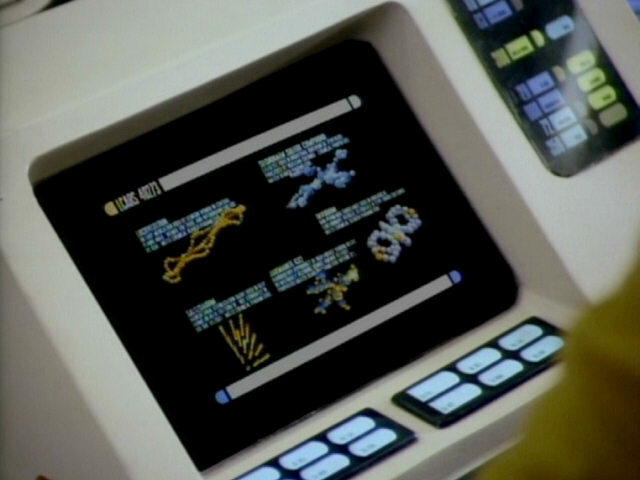 "Booby Trap" We can see more details and we can almost read the small writing in HD. 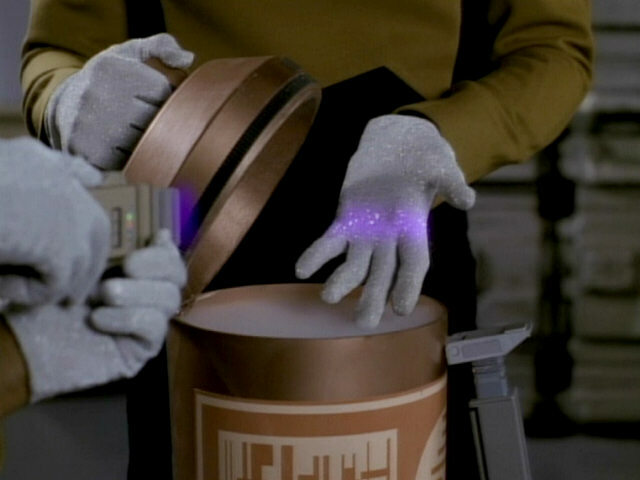 Note the misspelling "Deteurium", which was not fixed in the remastering. 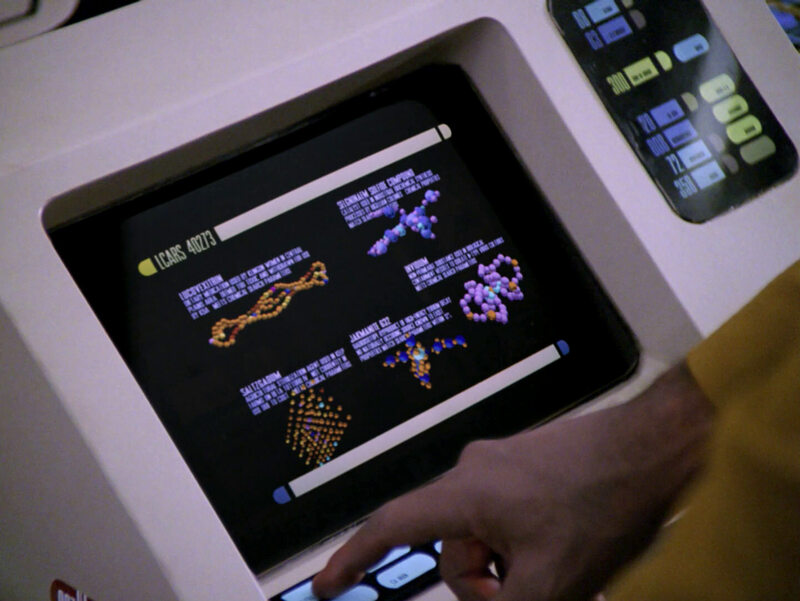 Graphics of and information about five substances that might be responsible for the malfunctions aboard the USS Enterprise-D. 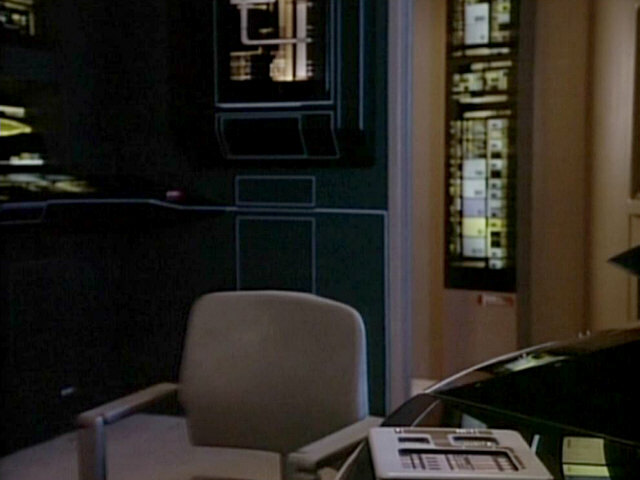 The footage of the pool table monitor was originally filmed for "The Defector". 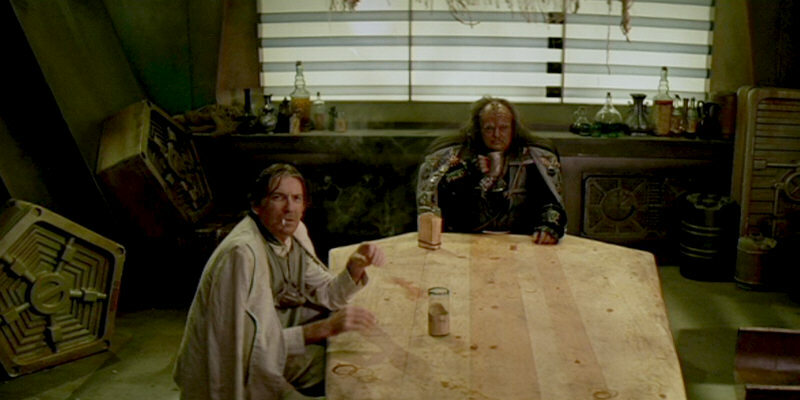 "The Defector" We can read the names of the substances in HD. 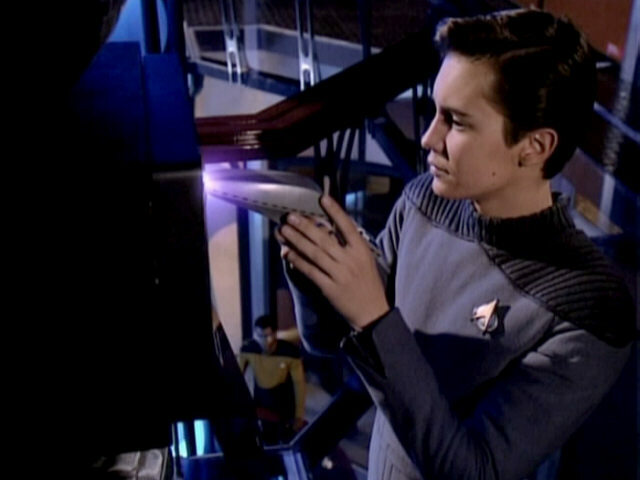 The invidium is made visible by a polarity scanner. 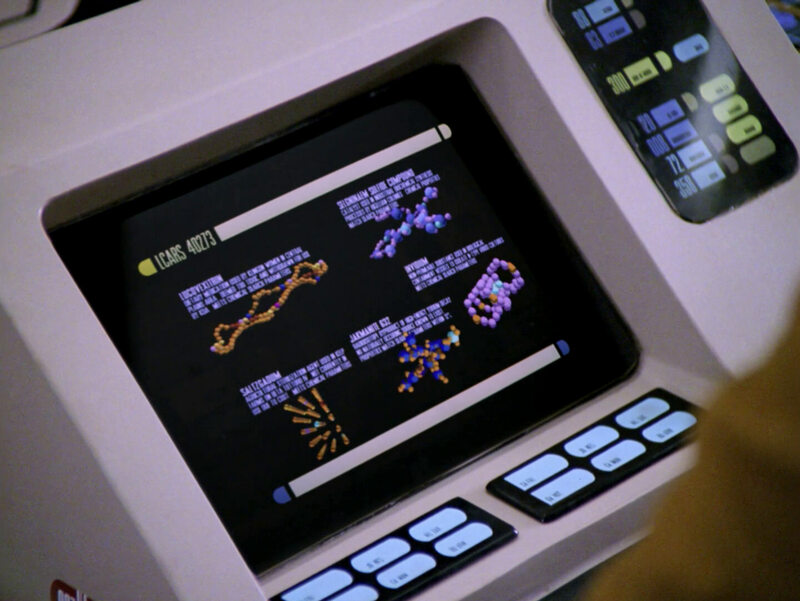 A look at the reconstructed effect in HD. 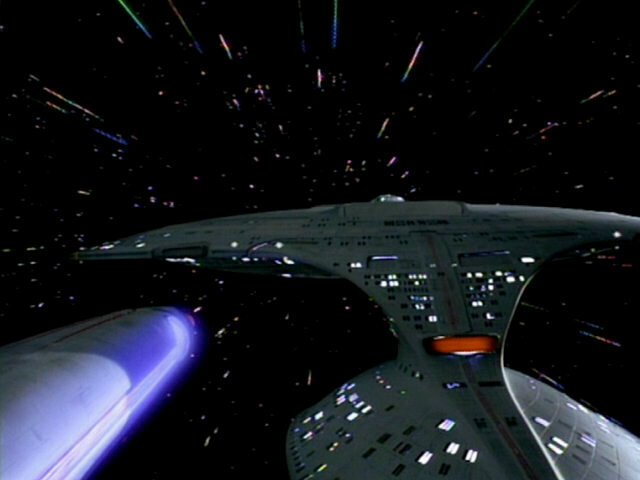 This footage of the USS Enterprise-D originally appeared in "Time Squared" when the ship is trying to escape from the temporal vortex. 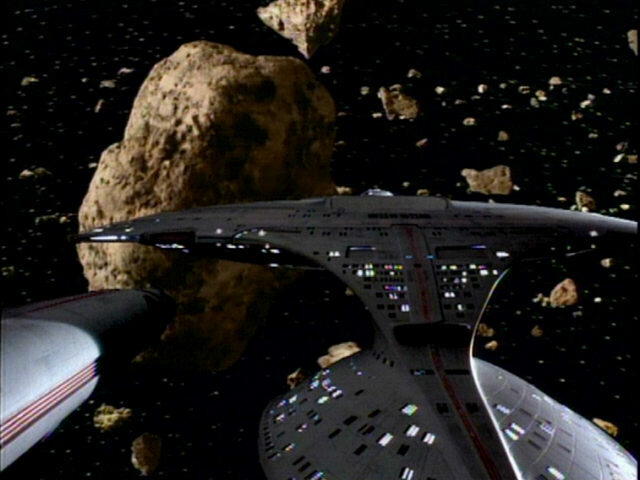 The footage also appeared in "Booby Trap" when the ship is navigating through the Orelious IX asteroid field, using maneuvering thrusters. 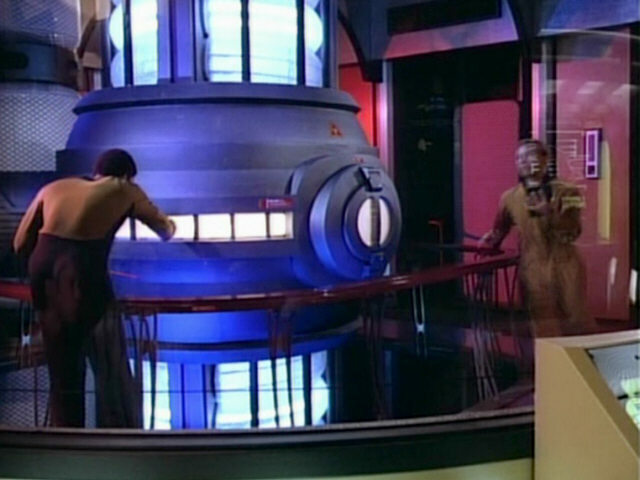 "Booby Trap" The shot as it appears in TNG-R. 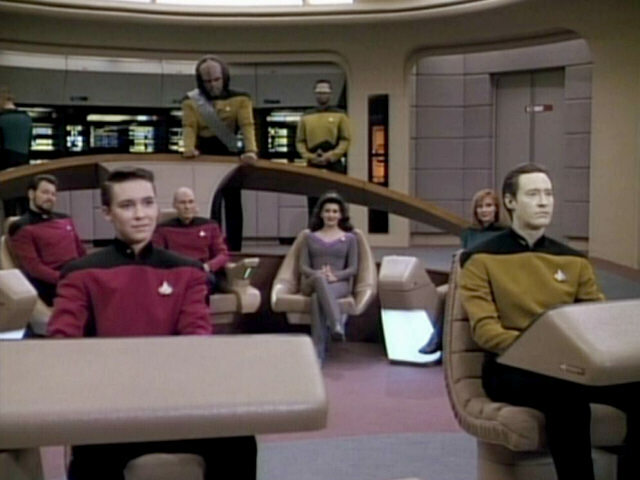 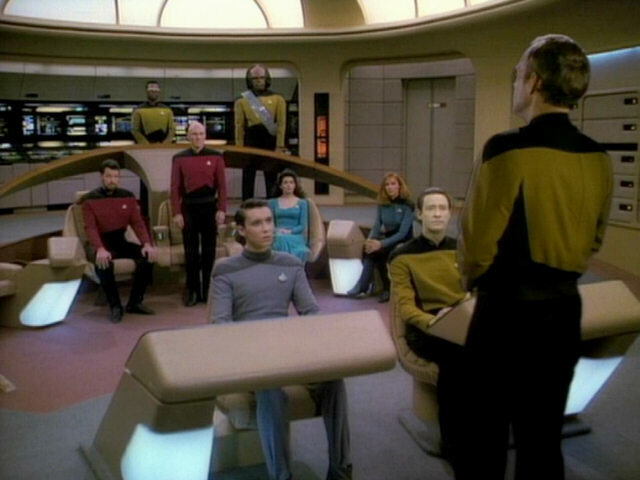 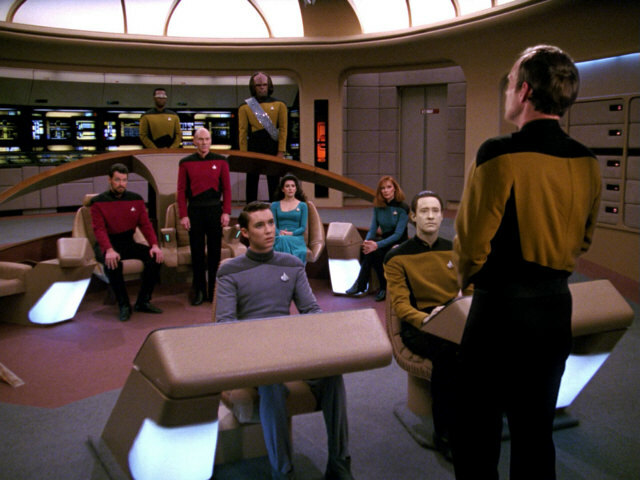 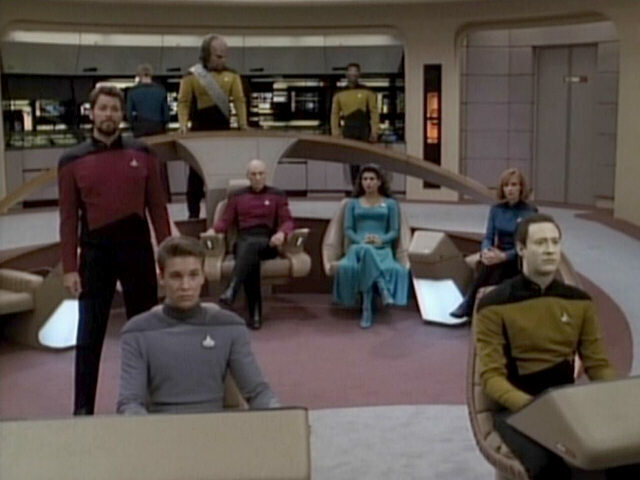 This is one of the rare cases when all principal actors of TNG are seen on the bridge at the same time, even if this is only in one of Barclay's holoprograms. 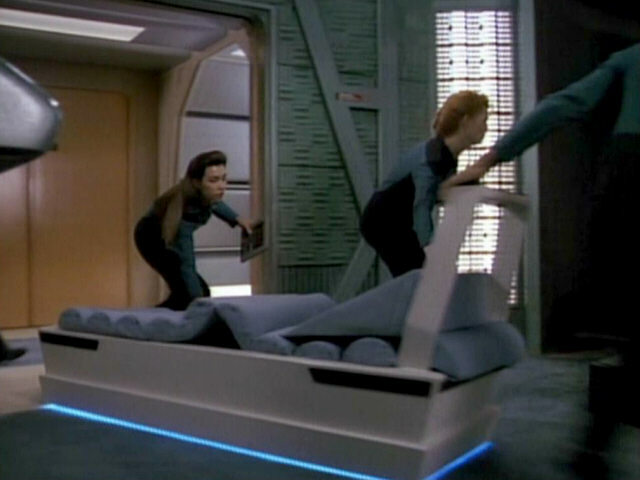 This happened earlier in the season, in "The Survivors" and will happen again, in "Ménage à Troi". 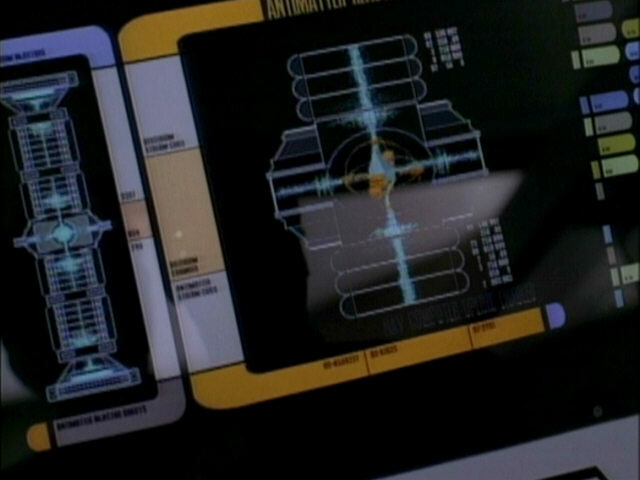 "Ménage à Troi" In TNG-R we can see a microphone at the upper edge of the reframed screen.